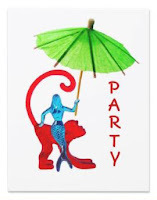 A blue plastic mermaid holds a drink parasol while sitting on a red cocktail monkey. Perfect invitations for your pool party. Customise by adding your own text. Make your own party invitations with this fun border of cocktail animals on drink stirrers. More fun cocktail mermaid stuff. Tshirts, drink coasters, summer drinking glasses shot glasses and more!